Imagine looking through a technologically revolutionary pair of binoculars and viewing the past or future. Simply input the date you wish to view into the keypad and select enter. Hold the binoculars as I demonstrate above and view the world around as it was, or as it will be. I spent a few days looking around East London viewing life on my street in 1922 and visited central London to see what will be happening there in the year 2045. The future looked similar to now, busy people, road works, some more high rise buildings, video advertising was everywhere, quite a lot of bicycles, it looked like the 80’s was back in fashion, again. I did notice some young people had baseball caps where the brim appeared to be an interactive screen of some sort. Unfortunately these binoculars are only useful for viewing so I couldn’t ask any questions. Me looking at East London in the past demonstration. Future and Past Viewing Binoculars were designed and made by me, Dominic Wilcox for my Selfridges window during the Festival of Imagination starting Jan 7, 2014 onwards. Above photographs of Dominic Wilcox’s objects taken by Pec studio. 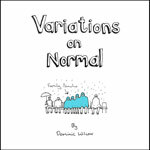 Next Post Variations on Normal book to be published!